One source of data for all your use cases. Integrate, explore and consume your data in one central platform. Contiamo simplifies access to your data by logically integrating disparate data sources without requiring changes to the underlying data setup. Explore, analyze, and consume data in the blink of an eye, directly from the source. 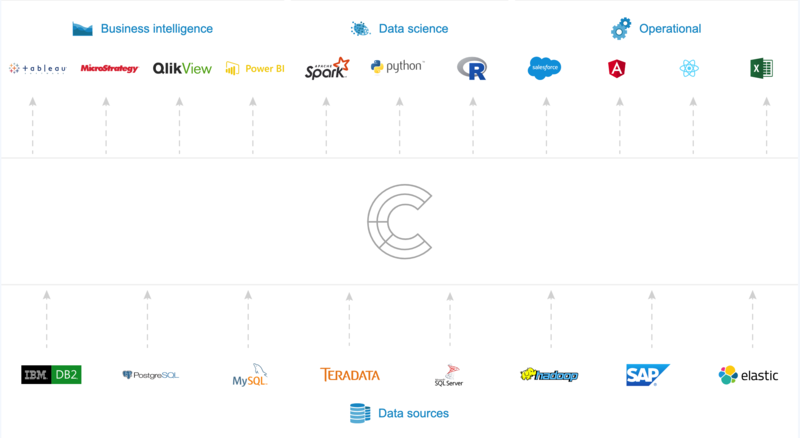 Contiamo replaces slow, expensive ETL and delivers analytics in real time. Contiamo enables compliance and reduces governance complexity via granular access management and role-based permissions. You choose how to govern your data. Enable business users, data scientists, and data engineers to independently access and digest data for any analytical or operational use case. Stay on top of changes to your data landscape. Contiamo adapts to the evolving needs of your business, on your terms. One-click integration for the most popular traditional and modern enterprise data sources such as Oracle, Teradata, Db2, BigQuery, SAP HANA, etc. Built-in schema configuration enables complex transformations and schema creation in an editor with familiar features such as syntax highlighting and autocompletion. Apache Calcite and Spark execute queries based on query complexity and cost, keeping your workload light and maintaining efficiency. Industry-grade analytical processing server and query engine to process data at lightning speed. Deliver your data to any enterprise application via REST API endpoint integration and JDBC/ODBC connectivity. Contiamo is available in the cloud, on-premise, or as a hybrid solution adapted to your situation on the ground.